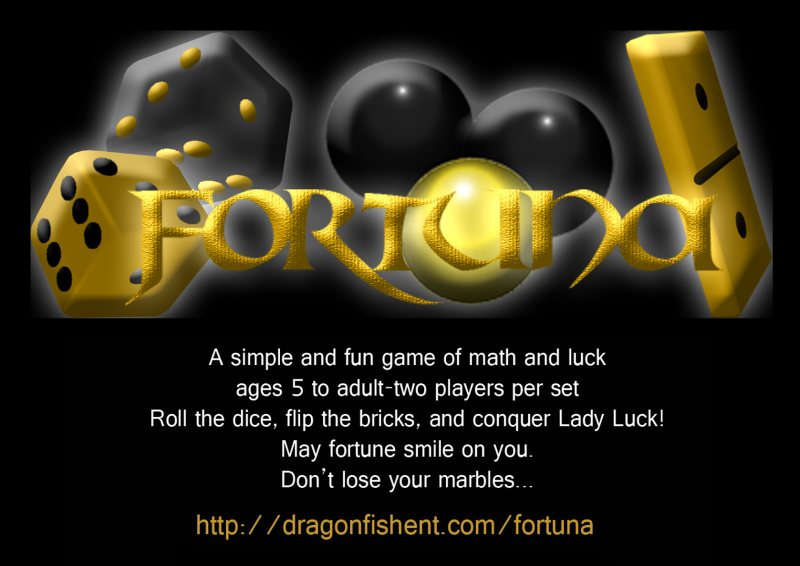 Fortuna is a fun game of math and chance. The object of the game is to accumulate the highest total score by either directly matching rolled dice or adding and subtracting rolled dice with exposed bricks before either player loses their three marbles. The game works with any even number of players, which requires one box set for each pair of players. For now, we will discuss two players. 3. Flip over two bricks to reveal the values. 4. Compare values of dice and revealed bricks. 5. If any valid scoring conditions are met between the bricks and the dice, the score is added to the player’s tally. On a successful turn, one marble may be retrieved from the dungeon if previously lost. If unsuccessful, one marble must be surrendered to the dungeon. 6. The next player starts over with step one. Play continues until one player loses all of their marbles, or until an established point threshold is reached. Scoring is based on the relationship between the face values rolled on the dice and the face values of the revealed bricks on each player’s turn. The blank bricks represent zero and have no face value. Under normal circumstances, only the dice are compared, added, or subtracted, and the brick faces are never altered. Each marble represents a turn for the player. The length of the game varies, depending on how Fortunate the players are. The simplest way to score is by directly matching the face value of either die to the face value of either brick. For example, a player rolls a 1 and a 5 on the dice and then turns over two bricks with the values of 3 and 5. The face values between the 5 die and the 5 brick directly match. This example is a normal scoring condition which adds five points to the tally for this player. The other simple way to score is if the face values of the dice can be added to or subtracted from each other to equal the face value of one of the revealed bricks. The face value of that brick is added to the player’s tally. For example, a player rolls a 1 and a 3, and then reveals the 4 and the 5 bricks. The 1 die added to the 3 die equals the face value of the 4 brick. This example is a normal scoring condition which adds four points to the tally for this player. There are four Fortunate ways to score double points in a turn and confiscate a marble from your opponent. These conditions and examples are listed below. You are required to call out the name of the special score or face a challenge from your opponent. In a successful challenge, you will lose a marble, and your opponent may gain a marble, so it’s very important to pay attention to the scoring. HAPPINESS—if you’re mega Fortunate, you’ll match the face value of both dice to the face value of both bricks in one turn. The face values of the bricks are doubled for your score that turn. The opponent loses one marble to the dungeon. For example, a player rolls a 2 and a 3, and then reveals bricks with the face values of 2 and 3. This is an unlikely, yet ideal condition, thus “Happiness!” This example is a bonus scoring condition which yields ten points. CHEESE—the face values of the dice are 5 and 6, and the 5 and 6 bricks are revealed during a turn. This is the highest scoring variant of Happiness in a basic game, yielding twenty-two points for that turn. The opponent loses TWO marbles to the dungeon, making it possible to end the game with a Cheese. SMILE—the value of one die is half the value of the other, and the value of the lower die is the same as the value of one brick. The face values of the bricks are doubled for your score that turn. The opponent loses one marble to the dungeon. For example, a player rolls a 2 and a 4, and then reveals bricks with the face values of 2 and 5. This example is a bonus scoring condition that yields fourteen points. There are only three dice combinations in a regular two player game that can create this scoring condition: 1 and 2, 2 and 4, and 3 and 6, with one of the brick face values equaling 1, 2, or 3, respectively. GRIN—the face values of both dice are the same, and one of the revealed bricks matches them. The face values of the bricks are doubled for your score that turn. The opponent loses one marble to the dungeon. For example, a player rolls a 1 on both dice and then reveals the 1 and the 4 brick. This example is a bonus scoring condition which yields ten points. There are two unFortunate ways to score fewer points in a turn. Also, you cannot free your lost marbles from the dungeon or send your opponent’s marbles to the dungeon, or the dungeon stays fixed. These conditions and examples are listed below. You are still required to call out the name of the particular score or face a challenge from your opponent. In a successful challenge, you will lose a marble, and your opponent may gain a marble, so it’s critical to pay attention to the scoring. HALF SMILE—the value of one die is half the value of the other, and the value of the higher die is the same as the value of one brick. This is the opposite of a Smile, and the face value of lesser brick is your score for that turn. No marbles are lost by the other player, and none are retrieved by you. For example, a player rolls a 2 and a 4, and then reveals bricks with the face values of 5 and 4. This example is a penalty scoring condition which yields four points. There are only three dice combinations in a regular two player game that can create this condition: 1 and 2, 2 and 4, and 3 and 6, with one of the brick face values equaling 2, 4, or 6, respectively. WOLF GRIN—the face values of both dice are the same, and either one or both bricks equal the dice via addition or subtraction. This is the only instance in which you calculate the bricks instead of the dice. It is similar to a Grin, but the key difference is there are no directly matching bricks revealed. Scoring here is based on the total of one or both bricks. The face value of lesser brick is your score for that turn. No marbles are lost by the other player, and none are retrieved by you. For example, a player rolls a 3 on both dice and then reveals the 1 and the 4 bricks. 1 subtracted from 4 equals the 3 rolled on the dice. This example is a penalty scoring condition which yields one point. As stated before, Fortuna can be played by any even number of players. This requires one game kit for each pair of players. Fortuna can be played Gold Team versus Black Team or every player for themselves. Also, in a game of four or more players, you may choose to roll the dice and flip bricks equal to the number of players for even bigger scoring fun or stick with the traditional two dice/two bricks per turn for narrower odds. Either way, you choose to play, may Fortuna smile on you!